Ever Wonder What Spider Mite Looks Like ? I have a very bad infestation on my Den densiflorum. At first I thought it was lacking in minerals, so have been dosing it up a bit, but to no avail. The leaves have the appearance of sunburn, but, in a green house ??? Usually before I go to bed, I do a quick walk through the GH looking for "night nasties" who munch on leaves, as this has been an ongoing issue for me. It wasn't until I did the CSI bit and shone my bright torch on the plant, that the reason the leaves looked c#%p was obvious. During the day you can't see this damage. These are Spider Mite, and all the little dots are individual creatures munching on the goodness of the leaves. I have quarantined the plant away for my others, and luckily, they have been happy staying put. Once they destroy this plant, is probably when they'll decide to mave to "greener pastures". I will be treating with Rogor at 10ml per litre (Malawash will do the same job), repeating in a week, then a further week. At that stage, I'll strip all the leaves off the plant and dispose of them so there's no chance of reinfection. To say I am very p%$#ed off would be a gross understatement, as this plant was really progressing well until this setback, so I would say I have now lost a flowering season from these little varmints. Chantie and kdennis14 like this. oh ick. What causes these little bits of evil to attack an orchid? What are the symptoms we should be looking out for? Thanks for posting this Anton. It will be very helpful for people who are trying to diagnose problems with their plants. 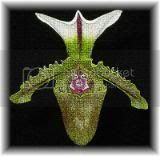 I have made this thread "sticky" and I have also rated it 5 stars. Members will notice the rating feature on the right-hand part of the bar at the top of the first post in the thread. I encourage you to rate especially useful threads like this one. oh ick. What causes these little bits of evil to attack an orchid? In a word: food. They feed off the sap of the plant. What are the symptoms we should be looking out for? Never had mites on my orchids, but I've occassionally had them on other plants. By the time I found the mites, it was almost too late. Sometimes I felt a loss of patience in getting rid of them and actually dumped a plant or two, just to save the others. And I also had trouble finding a good miticite and probably used products that were not completely effective. These evil critters seem to appear overnight and by the time you spot them, they've done a ton of damage. Good luck on getting rid of them. I think this plant was infected when a friend of mine gave it to me without realising. Her GHs are chock a block with little room between plants, and this helps harbour little nasties and diseases. THIS is one of the reasons WHY I WONT overcrowd my new GH. if it is crowded, you can't see every plant clearly to be able to scan for nasties. I have also received plants from another friend who also has crowded orchid accommodation, and those were infected with Mealybugs and scale, so,there's a strong message there, DO NOT CROWD YOUR PLANTS !!! It is better for them not to be crowded with plenty of room for air movement and to enable light to reach each and every plant as these critters do not like light much and love to hide on leaves that are in deep shadow / shade where there is not much air movement. This is good advice for newbs to follow. Up until now, I have not had this type of problem, and this is another reason to quarantine new plants, and if possible repot them into YOUR mix which SHOULD be clean and pest / disease free, and to also give them a dose of antifungal and pesticidal mixtures to prevent / cure any potential problems. As this plant has so many canes and leaves, it was hard to pick up until I shone a bright torch on it at night. It is amazing what you can pick up at night with just a torch, as your focus is just where the beam is directed and you become oblivious to everything else. During the day, as there is so much diffuse and scattered light, a lot of things become invisible, such as these blighters. I thought this plant was lacking in minerals, and even with dosing it up, the leaves just got worse. It looks like sunburn as mentioned in my original post, but the under side of the leaves resembles a fungal type infection, how wrong was I ! EDITED IN: Malawash contains the constituent Malathion just in case Malawash isn't available as a brand in the States. Last edited by Anton; 04-04-2010 at 08:47 PM. Bad topic, but great photos Anton. I learned this winter that crowding makes it much harder to keep an eye on things. Thank you so much for posting about this, although I'm quite sorry to hear that you're having this problem. I myself have bought many too many plants recently, without the growing space at home to accomodate them. I've been smooshing them together, and check everyone each day by picking up each individual plant, but this is a good reminder that I must get serious about buying a bigger plant rack! I hope that you can save your plant, and that you stomp out those buggers! One of the ways I have always tested for spider mites is the "white paper slap & smear test". Take a flat piece of white paper, or any flat white surface that you can hold, and put it under the leaf of the plant and slap the leaf. Run you hand over the white surface and look for little red streaks, if you see any then you have spider mites. This is a helpful test if the infestation is fairly new and there isn't noticable webbing like you have on your plant Anton. With scale I use White oil every 2 weeks for 6 weeks to kill off the juveniles. Once clear, during growing season I still do it monthly just to be sure, except when there is hot weather. Never use White Oil during hot weather, the plants can't breathe properly with the oil on the leaves. I am forever cleaning the floor, being river gravel, I can't afford top let debris work it's way in, too hard to get it out. I regularly (monthly) spray the whole inside including the walls up to the 3 metre mark with fungicides, alternating between a couple of different ones so they don't get immune to it, then pesticides to keep spiders, flying creatures, cockroaches, and creepy crawlies at bay. I have finally found a source for concentrated Pyrethrane, so will be adding that (monthly) to my feeding regimes from now on as a prophylactic treatment during winter when the house will be mostly shut up during inclement weather (we are hoping for a wet winter for a change) as this will be ideal breeding conditions for little munchers. Certainly a very useful thread you have started here! As soon as I read it grabbed the torch and went outside, didn't find anything but a great idea. I used to be retired now I'm just tired. Rogor will work fine, however, take care not to breathe it in.. it is a nerve poion. I had a mite infestation on my rose plants last week, and i used some mineral oil based pesticide, 2.5ml to 2 liters of water, sprayed in an emulsion. The emulsion works by coating the pests with mineral oil and suffocating them. It does not coat and suffocate leaves, rather it is repelled by leaves and attracted by the exoskeleton of pests and insects. Spider mites can lay up to 20 eggs a day and hatch in as little as 2-3 days, and become sexually mature in 5 days. If you are able to break this cycle, then the chances of a re-infestation should be very very low and the plant will not have to suffer without leaves.. I am going to spray the whole GH and be done with it. Luckily I have a dust mask that also has a filter for toxic gasses. Thanks Anton, great thread, I know what you mean, been there seen that. Tonight after work, I sprayed ALL PLANTS, floor and walls with Rogor 100. If the Rogor don't get 'em, the smell will. So, hopefully ALL creepy crawlies and leaf munchers will go bye byes. A penny saved.... will eventually be spent on orchids. B) thanks for posting this...it's very helpful to see good photos of the buggers. C) Famous last words "I won't overcrowd my GH!" This morning on my pre-work wander around, there are NO signs of life in the pots ! Willowbanks described it as Hiroshima. Where I used to have fungus gnats, earwigs and other wierd and wonderful creepy crawlies.......... NAADAA ! ZILCH ! KAPUT ! DEAD....SILENCE. Yeeessssss ! rosa and kdennis14 like this. Phalcycle it has Malathion as a constituent, should be available in some form over there. It seems Rogor 100 which I used, is an Australian product. Anton (The Mayor of Hiroshima), Rogor is Dimethoate and should be available in the US. Looks like Malathion, smells like Malathion, tastes like Malathion, so I assumed it was Malathion. Just a word of caution guys, wear a mask!!! My uncle who once worked for the Ministry of Environment, slipped into a coma after inhaling too much of the vapors; on one of their mosquito busting operations. Please please wear a mask when spraying and take a bath after your pest busting operations as well. Keep children, pets and especially pregnant wives away. I have a mask with a toxic gas filter that I use, and had a very lengthy shower afterwards, I am well aware of the impact of these chemicals. My wife is well past child bearing and won't come anywhere near me while I am spraying anyway. All blinds were up allowing plenty of air flow whilst spraying. The day after spraying was when I could literally taste it in my mouth, and that's after it was a dry. Needless to say, I have achieved the desired result, a sterile environment for my orchids, so one more spraying soon to get any juvenile creepy crawlies should do it. Mr Mayor, you must have the neighbours wondering where the smell is coming from??? This is the best thread thanks so much Anton for the pics and all of the info. Newbies like me need this kind of info I'd never seen a spider mites but I know what to do now if I see them. Some species dont spin the characteristic web, but they all look the same. Tiny red/brown specks appearing especially on the underside of leaves. Last edited by yokurt; 04-08-2010 at 12:40 PM. I hate these little guys. One reason I don't wear shoes in my house! melathion don't kill mite. Oil and water do. U can kill mite with mineral oil by engulfing the "insect". I been having weekly schedule of white oil since 2 years ago. I don't see them anymore. Only problem is my plant is outdoor, so mite will keep coming back again and again and again and again, and again and again. So weekly spray is compulsory for me. Yes, esp in tropical climates, the fast rate of reproduction of these mites enables them to become pesticide resistant. I had a major infestation at the tail end of last summer, affecting 3 plants; a Brugmansia, Datura & my Sollya heterophylla. The Brug & Datura were easily taken care of with a combination of systemic pesticide & wiping the leaves twice a day with a wet sponge. However, I have only just in the last month dared to declare the Bluebell creeper free of mite. I've been alternating the systemic pesticides (as someone had also suggested that they may build up an immunity), but the leaves are too many & too small to wipe. So a couple of months ago, I started spraying it twice a day with 2 litres of water (just water) in a fine mist. 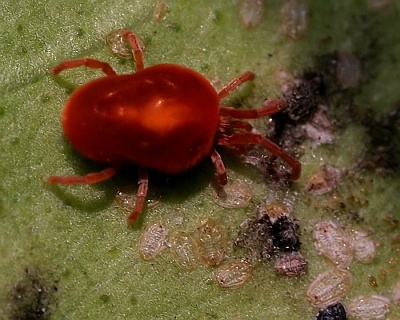 Although the leaves have suffered a little scorching, that damage is inconsequential compared to the damage that red spider mites inflicted upon it. 2. do you use it as recommended on the label? 1 oz. per gal? 3 do you spray blossoms also? I have been using, " Safer Soap" but now it appears that I have thrips again, I spotted one,( with a magnifying glass) this morning and was wondering should I begin a weekly regime with Malation? I have read that the thrips or other insects become immune to the same treatment after a while. Could you tell me what you do weekly to keep your plants healthy? It is best to try not to use the same products all the time as they become immune to it, be it pesticide or fungicide. The product I actually used is an Australian product called ROGOR - 100 in which the main constituent is Dimethoate, where originally I thought it was Malathione as it smells very much like it. Both products work well and spray tops and bottoms of leaves, as well as into the mix. Repeat after 2 weeks, then again in a month, that way you should zap all juveniles plus any late hatching eggs. See if you can get the Dimethoate over there, if so take EXTREME CAUTION when using this product as I know of some cases where people mixing this have collapsed, one of whom went into a coma. Wear a protective mask that filters the air when mixing and using and make sure you remove your clothing when finished and rinse it out as this stuff does absorb into your skin. BUT, boy does it work, my GH is virtually "sterile" from pests now, 3 weeks after treatment. I sprayed walls, benches and floors as well as the plants to leave nowhere for them to hide. I haven't even had any munching signs on leaves since either. Next weekend I'll do my 1 month follow up to set me up for winter when the GH will be shut up for lengthy periods. I'll also do an anti fungal treatment as well. I've got just regular iddle spider on my plant...and ive seen earwigs (or thats what we used to call them ionno if thats there proper name) wandering around my plants cause their on the back porch...and it looks like something had been nibbling n the leaves...anything i can do about it? Thank you, Anton. I've never had a Spider mite problem before, but I'll know what to look for when I suspect one. Many thanks to Anton and others for helping me identify a spider mite infestation on my dendrobiums. As a newbie I was searching for help with my ailing dendrobiums. I noticed the characteristic silvery leaf damage here and there but didn't see any little bugs. The leaves were also yellowing and dropping without any kind of pattern. I treated with Neem according to pkg instructions several times but leaves kept yellowing. Also tried Malathion, Rose pride for rot,... Thought maybe it was rot since there was dark damage on the cane where the leaves attached. BUT when I pulled off several yellowing leaves (ready to drop anyway) I noticed a bright orange powdery "dust" right at the stem. With an toy microscope (from the kids) I could see many bright orange bug bodies looking just like Yokurt's pic. (thank you!) Our local farm supply lady recommended I use Bayer 3-in-1 for mites. I'm amazed at how quickly my orchids improved after just one treatment. No more yellowing leaves and bursting with healthy sprays of flowers. No more mites sucking out their energy.... Yayyy! Thank you again Geeks! I aspire to be like you all someday. wow! those little bugs look horrific! I was thinking that maybe one of my phals had them. Still not 100% sure if it does or not. The bark looks kind of like your dens did. Meaning the webs. It is not too prominent, was told that it could just be dust. But I am not totally convinced that it is. Thank you for posting this. It was very insightful! Wow once again so much good information. I hope I never need it. "DON'T YOU DIE ON ME MIA!!!" Ihave problem on Hibiscus plants they are on stems!!! I just wonder can we use normal pesticide like Ridsect to kill spider mite? I have since tried pyrethrum spray and it seems to have worked, and is more eco friendly. I've read some threads that the Organocide is good and saw a recipe for soaking the orchid before repotting. I use 'takedown', a pyrethrin that is one of a few I know that will actually kill eggs of the 'devil's spawn', as I call them. Since you can never get them all, I start using azadirachtin on a weekly basis. The azadirachtin kills the appetite, and prevents sexual maturing, so the reproduction cycle is interrupted. It is a secondary metabolite present in the neem tree seeds, the one I use is OMRI. OPPS! one more thing I wanted to add: Whenever using anything foliar....always use a 'sticker', something to break the surface tension on the leaf, so that what you spray will not just run off. There are many products that you can buy (I use coco-wet), but many people just use dish soap. hi anton, just a doubt...did u dunk the root system into the rogor solution, or spray the leaf surfaces as well? Following my post in June, I'm still using Organocide to rid to the yucky spice mites. There are a lot of spiders where I live so I'm contently cleaning webs from corners of rooms, windows, etc. I was wondering how often should I spray the orchids? Anton, you mentioned you spray your plant once a month, will it hurt the plant if I spray every other week? I clean the leaves off with just water, but the pesky pests come back. One of my orchids already gone to orchid heaven, I'm desperate to keep my 3 plants alive and well. I just found out I have mites! Aaaagghhhh! I read that cinnamon works well. Any thoughts or advice on this tactic? Also, my Mom used diluted dawn dish soap for her roses, kept the bugs off, will it work for orchids? I don't have much money, is there something cheap I can use? When life gives you lemons ...grow orchids!!! Soap and water will remove the mites. Also a good stream of water can knock them off the plant. My first line of defense against bugs is my garden hose. I've found the only successful way to rid mite infestations is a tactical nuclear strike. 1joyceh and kdennis14 like this. Cinnamon is an antiseptic to put on cuts to plants eg: when you cut leaves of the bulbs on Catts, accidentally scratching the surface of a leaf, cutting part of a damaged, infected leaf. Look for the "best stuff ever" thread in the Pests and Diseases section of the forum. It consists of water, dish soap, and cinnamon extract. I have used it successfully to get rid of spider mites several times. PaulB and kdennis14 like this. My only sucess has been from using a dedicated miticide. Rogor has now been removed from the shelves and replaced with malathion - which is the same as far as I know. Rogor never killed my mite problem, but miticides did. Only problem is to use different ones so you dont give immunity to the bities. I purchased Ortho RosePride systemic spray a while ago to get rid of mites on some carnivorous plants that are extremely sensitive to pesticides. It worked and I've been using it on the orchids the one or two times I've gotten in a plant that turned out to have mites or Aphids. The active ingredients are Acephate, Resmethrin, and Triforine. Because it's an aerosol spray it really coats everything well. Cheap too, $7.99. Mites and other creepers are one thing I won't mess around with, I've only ever had to spray a plant once with this stuff. I'll look for the malathion for next time, thanks for the reminder to switch products to decrease the chance of anything becoming immune. A wise idea. Last edited by JungleMel; 03-17-2012 at 08:00 AM. I hate does things!! Thanks for the super pictures!! Be aware of ants!! They carry a lot of disease, pests (often mites) and bacterial infections. If you spot them, get rid of them as fast as you can!!! R&P and kdennis14 like this.